Jorge Mario Bergoglio was born in Buenos Aires December 17, 1936. He earned a chemical technician’s diploma from his high school and entered the Jesuit novitiate in March 1958. As part of his Jesuit formation, he taught literature and psychology at Jesuit high schools in the mid-1960s, and he was ordained to the priesthood December 13, 1969. In 1973, he was appointed superior of the Jesuit province of Argentina. In 1992, Pope John Paul II named him an auxiliary bishop of Buenos Aires. He was promoted to coadjutor archbishop in 1997 and became head of the archdiocese in 1998; St. John Paul named him to the College of Cardinals three years later. 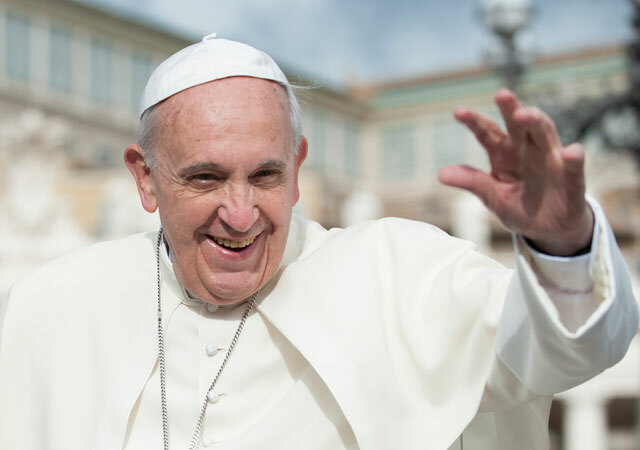 On March 13, 2013, he was elected at the age of 76 to succeed Pope Benedict XVI and took the name of Francis. Early in his pontificate, Pope Francis named an international panel of cardinals -- including Cardinal Seán P. O’Malley of Boston -- as an advisory panel for church governance. Their first ongoing task is to reorganize the Vatican bureaucracy. The pope has accepted the cardinals’ recommendations to establish a council and secretariat for economic affairs, a secretariat for communications and a commission to promote child protection. Pope Francis’ visit to Cuba and the United States marks the 10th foreign trip of his pontificate, and it is the first time in his life visiting the United States. The visit comes in a year packed with important events: the publication in June of Laudato Si’, his encyclical on the environment; the world Synod of Bishops on the family in October; and the opening on December 8th of a special Year of Mercy.